Dear @Candyland1932 , please start delivery service to my seat at #wits . Who is a back-to-back #wits attendee tonight? Super jazzed about sing along at #wits tonight. Get to be a pretend guitar slinger for a few minutes. Ok #wits I'm back for another season. Wow me. I am at #wits once again with @Janellie23 ! "@NatesBS : Just saw three people, from all over the metro, say it smelled like manure. What is happening?" @afterglide at #wits ? 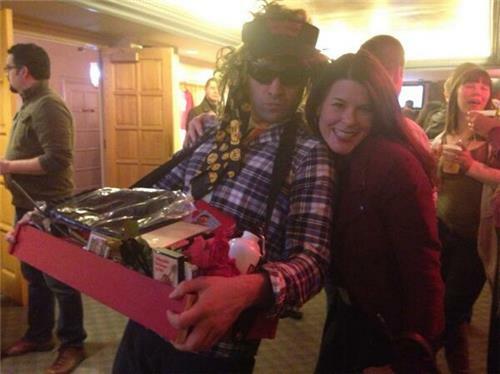 Are you going to do fireflies tonight on #wits with Rhett @winterbowser ? Hey guests of #wits , we're having a Pitch Perfect viewing party after tonight's show. You in @PFTompkins and @rhettmiller ? We'd like to give a special shout out to our first #Wits sponsor of the season, Hamline School of Business, who are in the house! Hooray!! Bangin' our heads with @BarbAbney and Quiet Riot (or was it Quiot Riot? Quiet Riet?) at #Wits . If @BarbAbney can bang our heads at #wits .. Maybe we can rock the TARDIS at Intermission? So, I was an extra in the Old 97's scene in the Break Up. Please, no autographs. 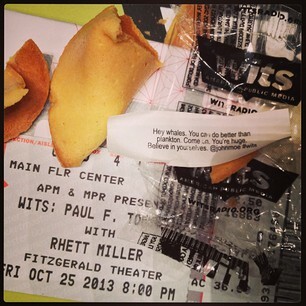 I am just here to enjoy some @rhettmiller and #wits . Second night in a row at #wits . I'm doubling down on the Double Take. It's the age old question - do I have time to hit the bar before #wits starts? We're all strange at #wits ! Great job @BarbAbney ! Hey, @BarbAbney is doing a great job as #wits DJ - let's make some noise for her. Thanks Barb! How many more people do you think we can #Fitz into #Wits ?